The NORMAL option requests the fitted curve. The INSET statement requests an inset containing the parameters of the fitted curve, which are the sample mean and standard deviation. For more information about the INSET statement, see INSET Statement. The resulting plot is shown in Output 4.35.1. The plot shows a symmetric distribution with observations concentrated 6.9 and 7.1. 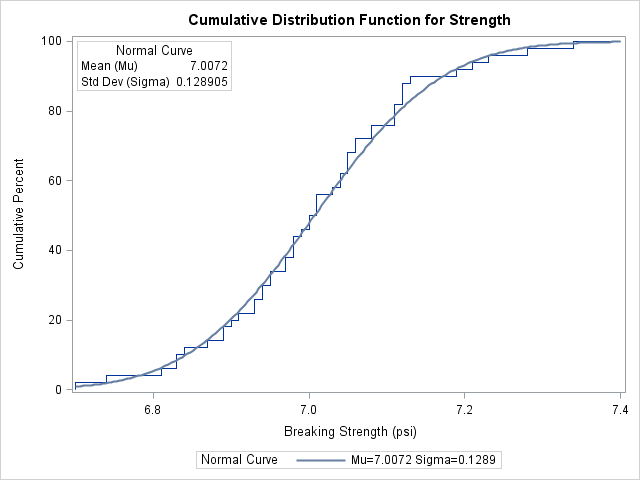 The agreement between the empirical and the normal distribution functions in Output 4.35.1 is evidence that the normal distribution is an appropriate model for the distribution of breaking strengths.